What’s the idea behind this start-up? The genesis of this business idea was simply the glaring supply chain gaps in the fresh food categories (especially fruits and vegetables). We knew that retail prices of fresh products have a 100 per cent mark-up on wholesale cost and probably 150-200 per cent mark-up on production cost, still it is not a case of super-normal profits for either the wholesaler or the retailer. Majority of this margin got eroded within the supply chain due to the perishable nature of the products. Hence, we saw an opportunity to plug the gaps in the supply chain by getting products from farm to kitchen in 12 hours, avoiding wastage and pilferage which would allow us to make decent margins while offering a fair price to the end consumer. What’s the initial investment made to launch the venture? Where did you spend the money? Together with friends and family we initially raised over US$ 10,000, which was spent primarily on building a robust technology platform including the Android and iOS Apps. After launching the business we received seed funding from known contacts for another US$ 100,000 before we raised our Series A funding in July’15. You are following the similar idea as floated before. How is it different from other similar platforms? 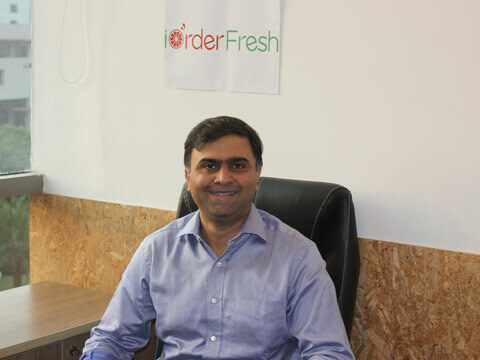 What makes iOrderFresh unique and a safe option is that we do not believe in night inventories and have only two delivery slots a day to ensure the freshest produce is being sent to consumers day after day. How big this segment is? How many players are working out there? It is one of the biggest consumer segments in the country currently valued at US$ 330 billion with expected market size of US$ 1 trillion by 2020. It’s difficult to know that how many players are in the market right now but the important thing to remember here is that there will always be room for more players in this market. What’s the revenue model of your platform? All sellers on our platform pay us a listing fee, which is a per cent of their gross revenue. What’s the annual turnover? What's the growth of your venture? We serviced over 1000 orders a day in Sept 2015 and are looking at a quarterly growth of 20-25 per cent for the next 12 months. In this segment, many online players have recently raised huge amount of funding. Are you looking forward to raise any funding for your venture? We are focusing on unit economics and making the business self-sustainable. However, further capital will be required and we are looking to raise another round of funding in Q1 2016. What’s the growth prospect of your venture? We have over 100k customer registrations and repeat customers account for over 55 per cent of our daily orders. We hope to cross 250k customer registrations by March 2016 in Delhi NCR only. There are no plans to expand to another city for the next 12 months. We want to consolidate our base in NCR and become the biggest player in our segment. What lies on the product roadmap? Currently, iOrderFresh offers an array of fresh products like fruits, vegetables, fresh organic cow milk, fresh meats, fresh poultry, fresh bakery and confectionary etc. We also want to offer iconic brands/products to our customers by forging exclusive partnerships on the same lines as Natural Ice Cream. We want to be the vendor of choice for premium quality and hard to find food and grocery items online. We are in advance talk to enter Europe and America..